Now that you have braces, it is more important than ever to maintain good oral hygiene during your treatment, says Dr. John Delplanche. While we trust you will continue brushing and flossing on a regular basis throughout your treatment at Raleigh Hills Orthodontics, you also have to mindful of what you eat. Our team will tell you that while all those sweet, sour and sticky candies may taste great, these treats can actually damage your teeth and braces! Sour candies, which many people like to snack on, can be acidic to your teeth, and actually wear down the enamel that protects them, resulting in tooth decay and cavities. 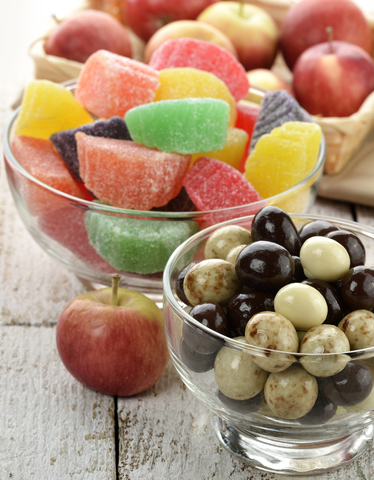 If you do indulge in eating these candies at some point during your treatment, be sure to wash your mouth out with water, drink milk or eat a few slices of cheese. These foods will help neutralize the acid in your mouth. Besides cavities and tooth decay, many people do not realize that good oral health and hygiene are important to your overall health too—researchers have discovered the connection between periodontal disease and other major health concerns, such as heart disease. Therefore, it is important to maintain a good oral hygiene routine just as you did before your braces. This includes visiting your dentist here in Beaverton, OR every six months, brushing and flossing daily and using an antibacterial mouthwash, as well as visiting Dr. John Delplanche for your regular adjustment appointments.